posted by Howard B. Owens in warrants, news, batavia, notify. The following people are wanted on warrants issued out of Batavia City Court. If you have any information on the whereabouts of these subjects, please contact the Batavia Police Department at (585) 345-6350. Do not make any attempt to apprehend these individuals on your own. If you have an active warrant and want to avoid ending up on a WANTED list like this, the Batavia Police Department would be more than happy to assist you on resolving the warrant. Charge(s): Aggravated unlicensed pperation of a motor vehicle, 2nd degree; operating a motor vehicle w/o insurance and with a suspended registration. posted by Howard B. Owens in Batavia Downs, Bridal Show, batavia. posted by Howard B. Owens in Joseph Ellicott, batavia, Bontrager Auction, news, notify. 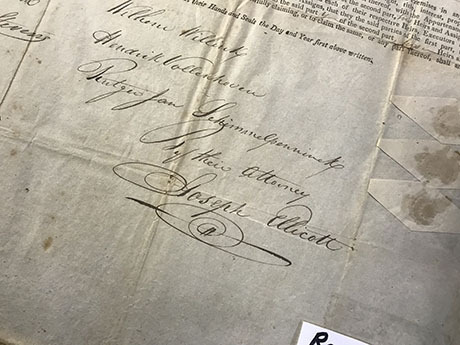 About a year ago, Dale Vargason, from Wayland, purchased a cache of documents from the late 18th, early 19th centuries and when he got them home, he found a surprise -- a deed to a piece of property in what is now Ontario County signed by Joseph Ellicott. 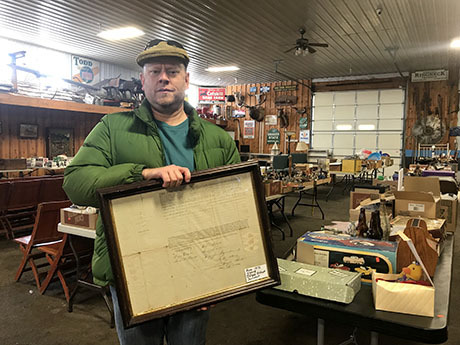 Yesterday, he dropped the deed, framed, at Bontrager's Auction on Wortendyke Road, Batavia, where Todd Jantzi said he will present it in a consignment auction featuring antiques and historical documents. A date for the auction has not yet been announced. "As soon as I saw the Joseph Ellicott I dropped everything else and said, ‘oh, my gosh’ and I started researching it," Vargason said. "I knew who he was but I wanted to figure out how much was this worth but I couldn’t find any comparables so I decided, ‘we’ll see’ and I thought I would hang onto it. When I mentioned it to Todd, his eyes lit up." Jantzi said it's a fairly rare document and should go for $600 to $800. The deed is from 1813. Ellicott was an agent for the Holland Land Company from 1800 to 1821. He laid out the first plans for the Village of Batavia and the Village of Buffalo. He signed many land deeds during those years. Documents of this much historic value don't come into the auction house often, according to Jantzi. "We might see it maybe once every three to five years," Jantzi said. posted by Billie Owens in crime, news, notify, batavia, Le Roy, bergen, pembroke, Alabama. Axel E. Antongiorgi-Colon, 32, of Prospect Street, Lockport, is charged with second-degree criminal mischief. On Dec. 8 at 10 p.m. on Main Road in Pembroke, the defendant allegedly damaged a vehicle in the parking lot of his ex-girlfriend's residence. He is due in Pembroke Town Court on March 21 to answer the charge. The case was handled by Genesee County Sheriff's Investigator Christopher Parker, assisted by Deputy David Moore. Cynthia H. Owens, 43, of Rochester Street, Bergen, was arrested on March 4 on three separate outstanding bench warrants out of Batavia City Court. She was also charged with three separate counts of third-degree bail jumping. Owens was arraigned in city court then jailed with bail set at $5,000 cash or bond on each warrant. She was due back in city court on March 7. The case was handled by Batavia Police Officer Nicole McGinnis. Nicole M. Albrecht, 35, Pleasant Street, Le Roy, is charged with petit larceny. She was arrested for allegedly stealing a television from Target at 1:27 p.m. on Feb. 8. She is due in Batavia Town Court at 1 p.m. on March 14 to answer the charge. The case was handled by Genesee County Sheriff's Investigator Christopher Parker. Douglas Mitchell Smith, 39, of Tara Drive, High Point, N.C., is charged with aggravated unlicensed operation of a motor vehicle in the third degree. Smith was arrested on a bench warrant out of Town of Alabama Court after he failed to answer a summons to appear in court Jan. 31 for allegedly operating a motor vehicle while his privilege was suspended in New York. He was arraigned on March 7 and sentenced to time served. He is to reappear in Alabama Town Court on Oct. 3 to pay his fines and surcharges. The case was handled by Genesee County Sheriff's Deputy Michael Lute. Zachary G. Garigen-Johnstone, 22, or Birch Circle, Rochester, is charged with unlawful possession of marijuana, running a red light, unregistered motor vehicle and uninspected motor vehicle. Garigen-Johnstone was stopped at 12:44 a.m. on East Main Street in Batavia for a traffic violation. Upon further investigation, he was allegedly found to have a grinder containing marijuana and a marijuana pipe. He was processed roadside and issued three traffic tickets. He was released on an appearance ticket and is due in Batavia City Court to answer the unlawful marijuana charge on March 26. The case was handled by Batavia Police Officer Miah Stevens, assisted by Jason Davis. Joshua Patrick Johnson, 21, of Redfield Parkway, Batavia, is charged with unlawful possession of marijuana and a window tint violation. He was arrested following a traffic stop at 9:42 p.m. March 2 on Lewiston Road in Batavia. He was released on an appearance ticket and in due in Town of Batavia Court on March 18. The case was handled by Genesee County Sheriff's Deputy Eric Meyer, assisted by Deputy Michael Lute. posted by Billie Owens in infrastructure, news, Ellicott Avenue, batavia, Road Closure. On Monday, March 11, between the hours of 4 and 10 p.m. Ellicott Avenue (between West Main Street and Mix Place) will be closed. National Grid will be replacing infrastructure so the road will be closed to all through traffic. Residents of Ellicott Avenue are asked to access Ellicott Avenue during this work from either Mix Place, Washington Avenue, Park Avenue or Richmond Avenue. Residents of Ellicott Avenue south of Mix Place will be permitted to access their property by entering/ exiting from the north side of Ellicott Avenue. National Grid anticipates three properties to experience an outage and they have already been notified. This work is weather dependent. posted by Howard B. Owens in crime, news, batavia, notify. Quinton L. Spinks, 33, thanked Judge Charles Zambito in County Court today for the state prison time he was about to receive on a drug-dealing conviction. "I would like to say first, I apologize to my family and to the community for my actions," Spinks said. "I would also like to thank you for this time because I was out there hurting myself and hurting my family. I appreciate the time to rehabilitate myself and get my life back on the right path and back to doing the right thing." Under the terms of a plea agreement reached in April, when Spinks admitted selling drugs to agents of the Local Drug Task Force, his sentence was capped at two years in state prison. Zambito said he was bound by that agreement and handed down that sentence. This will be the second stint for Spinks in state prison for selling drugs in Genesee County. He was arrested in 2010 and committed in 2012 to two years in prison on a criminal possession of a controlled substance, 5th, conviction. Spinks also faces federal charges in Maine, where he is named in an indictment along with several other individuals. In the federal indictment, he is named in only count one of the indictments, for conspiracy to distribute a mixture of heroin and cocaine. As part of his sentence, Spinks must make a $200 restitution payment to Genesee County for payments he received from an agent of the Local Drug Task Force. 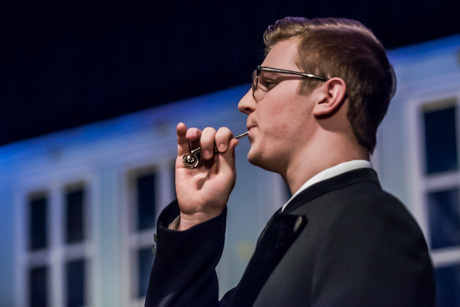 posted by Howard B. Owens in Batavia HS, batavia, news, arts, entertainment. 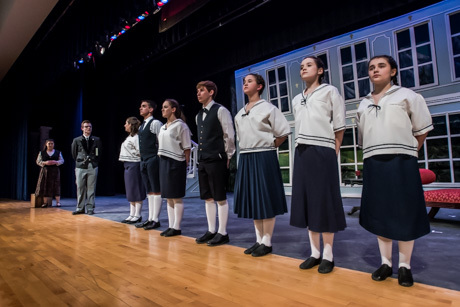 The Batavia High School Production Club presents the musical "The Sound of Music" in three performances starting tonight at 7 o'clock. 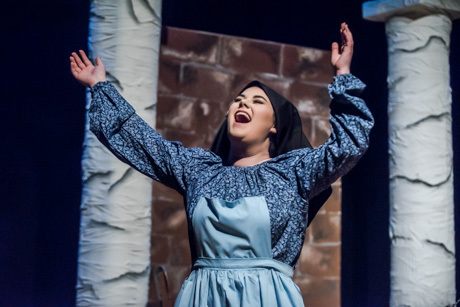 There are also shows at 7 p.m. tomorrow and at 2 p.m. Sunday in the high school's auditorium. Tickets are $8 for adults, $6 for students and seniors. posted by Howard B. Owens in GCEDC, news, business, batavia. The Genesee County Economic Development Center (GCEDC) approved incentives for two projects at the organization’s March 7 board meeting. Gateway GS LLC plans to invest $450,000 to build out the interior of an existing 27,000-square-foot spec building that the company constructed in 2018 at the Gateway II Corporate Park in the Town of Batavia. The project will create five new jobs. Gateway GS LLC will receive sales, mortgage and property tax exemptions totaling approximately $206,000. For every dollar of public benefit, the company will invest approximately $12.60 into the local economy. Gateway GS LLC intends to lease the space for various uses, including warehouse, distribution, light manufacturing, technology and commercial operations. The company has already lined up tenants for the improved facility, and plans to construct four additional buildings in the near future. Tenney Coin Laundry, which is located on Ellicott Street in the City of Batavia, is purchasing $197,896 in new equipment and was approved for a sales tax abatement of approximately $15,832. For every dollar of public benefit, Tenney Coin Laundry is investing $56.70 into the local economy. Tenney Coin Laundry also has submitted a grant request to the Downtown Revitalization Initiative's (DRI) building improvement fund for repairs to the facility's facade as well as structural improvements. Funding through the DRI is administered by the Batavia Development Corporation. posted by Howard B. Owens in batavia, news. 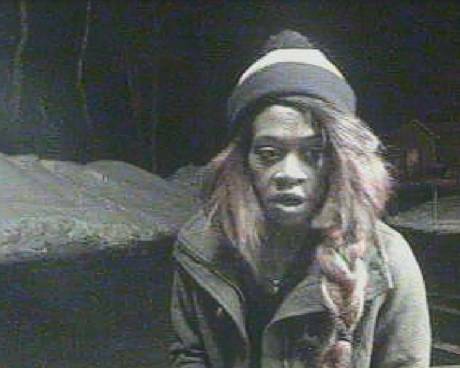 Batavia PD is trying to identify this person who used a local ATM machine on Saturday morning. No further information was released about the case. If you're able to assist, you're asked to contact Officer Marc Lawrence at (585) 345-6350. UPDATE 4:20 p.m.: The person in the photo has been identified. No further information has been released. posted by Lisa Ace in Sponsored Post, advertisement, Batavia First Presbyterian, Lent Yoga, Stretch, health, prayer, batavia. 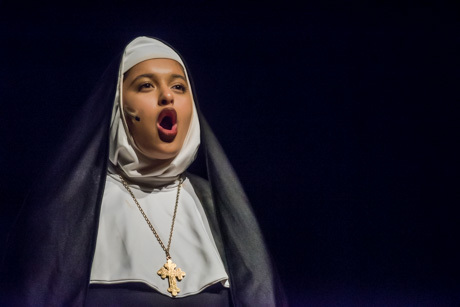 Stretch your soul this Lent. If you are longing for the gift of inner peace, we invite you to experience the power of inner stillness through stretching the body and attending to the soul. Join us during the season of Lent for contemplative prayer through chair yoga and centering prayer. No previous experience necessary. The yoga will be very gentle, anyone with any level of ability can participate. Batavia First Presbyterian is located at 300 E. Main Street in Batavia. posted by Howard B. Owens in GO ART!, news, arts, notify, batavia. Members of Human Services Committee expressed satisfaction with the job Gregory Hallock has done as director of GO ART! since being appointed to the job in July 2017. 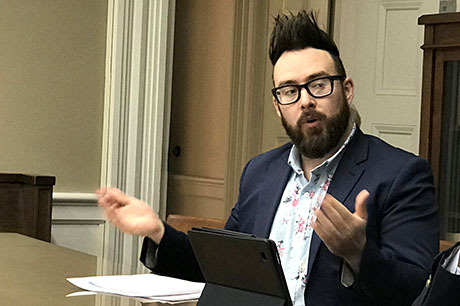 Since Hallock was promoted, he's instituted a number of new and innovative programs, expanded gallery shows, acquired a liquor license for beer and wine sales at Seymore Place, instituted profitable fundraisers, and generally raised the profile of GO ART! in the community. "We've had a new philosophy," Hallock said. "In the past, the philosophy was just to stay alive so they stopped doing some things to save money. Now we do things so people see us doing things and then they support what we're doing." In each of the past year, GO ART! has taken in more money than it has spent but because of depreciation on Seymore Place, the organization officially lost money, at least until 2018, when GO ART! was in the black by $40,000. All of the organization's debts, except for a mortgage on Seymore Place, taken out for building maintenance, have been paid off. One of the most successful fundraisers for GO ART! over the past year was the celebrity bartender challenge. Various prominent community members competed as celebrity bartenders with tips going to GO ART! as donations. The series of nights with celebrity bartenders bought in $13,000. Hallock said he wants to continue the concept by bringing in a celebrity bartender every Thursday. One of the benefits is the guest bartenders invite a bunch of their friends. Nearly 40 percent of the people who attended these events last year had never been to GO ART! 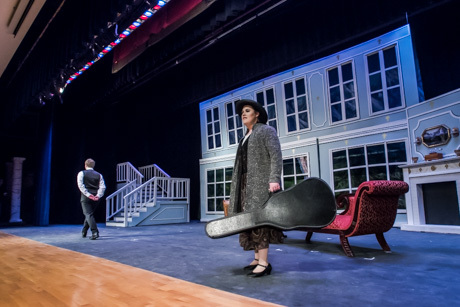 before, Hallock said, and the events also helped attract a younger audience, which has been hard for GO ART! to reach in recent years. The director is continuing to pursue big plans. He wants to get an elevator installed in the building and wants to expand the art garden behind the building. He is seeking grants for both projects. "You've done an excellent job to bring exposure to GO ART! and the building," said Andrew Young, chairman of the committee. "It's heads and shoulders above what we've seen in recent years. I see and hear about GO ART! activities everywhere and it seems to be paying dividends for you." Hallock said the credit doesn't belong to just him alone. "We have an awesome board and staff," Hallock said. "I'm the only one with a degree but everyone is passionate about it." posted by Billie Owens in crime, news, notify, Grand Jury, alexander, batavia, Le Roy. Ranelle E. Reuben is accused of driving while intoxicated, a Class D felony. 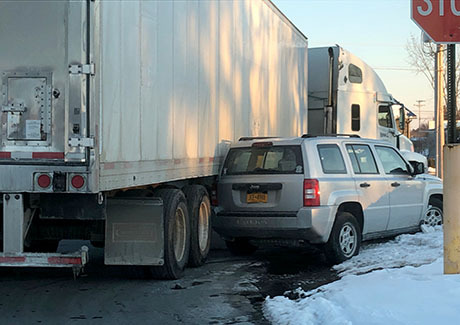 It is alleged that on Dec. 18 she drove a 2010 Dodge on Route 5, Route 98 and Batavia-Elba Townline Road while intoxicated. In count two, she is accused of aggravated DWI, per se, for having a BAC of .18 percent or more at the time. In count three, she is accused of aggravated unlicensed operation in the first degree, a Class E felony, for driving while her driver's license was suspended or revoked and while she was intoxicated. In count four, she is again accused of aggravated unlicensed operation -- for driving without a license while knowing it was withdrawn because she refused to submit to a chemical test, and while she was under the influence of alcohol or a drug. In count five, the defendant is accused of circumvention of an interlock device for driving a vehicle which was not equipped with a court-ordered ignition interlock device. In count six, Reuben is accused of following too closely in violation of vehicle and traffic law. It is alleged in count six that Reuben followed another vehicle more closely than was reasonable and prudent, in regard to speed, traffic and roadway conditions. In Special Information filed by the District Attorney, Reuben is accused of having been convicted of DWI as a Class E felony on Dec. 20 2012 in Genesee County Court. That conviction forms the basis for the suspension or revocation referred to in count three of the current indictment; and she knew or had reason to know about the 2012 conviction and the subsequent loss of her driver's license. Rodney S. Schwartz is indicted for the crime of driving while intoxicated, as a Class E felony. It is alleged that on Nov. 25 in the Town of Alexander that Schwartz drove a 2014 Ford on Route 20 while intoxicated. In count two, he is accused of aggravated unlicensed operation in the first degree, also a Class E felony, for driving that day without a driver's license, which had been suspended or revoked. In count three, Schwartz is accused of second-degree obstruction of governmental administration, a Class A misdemeanor. It is alleged in count three that he intentionally obstructed, impaired or perverted the administration of law or other governmental function by means of intimidation, physical force or interference, or by any independently unlawful act. In Special Information filed by the District Attorney, Schwartz is accused of having been convicted of DWI, as a Class E felony, on April 16, 2010 in Supreme Court, City of Buffalo, Erie County and that conviction forms the basis of the suspension or revocation referenced in the current indictment. Trisha A. Park is indicted for the crime of aggravated driving while intoxicated, as a Class E felony. It is alleged that on Nov. 30 in the Town of Le Roy that Park drove a 2012 Chevrolet on Wolcott Street while her ability to do so was impaired by the use of a drug and while a child 15 years of age or less was a passenger. In count two, she is accused of driving while ability impaired by drugs, as a misdemeanor. In count three, she is accused of endangering the welfare of a child by knowingly acting in a manner likely to be injurious to the physical, mental or moral welfare of a child less than 17 years old. 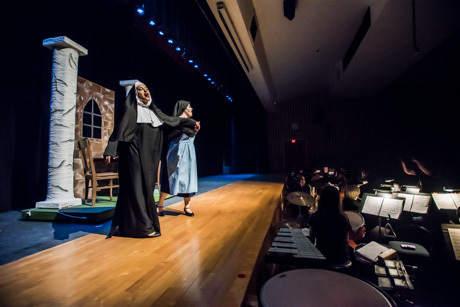 posted by Howard B. Owens in Notre Dame, batavia, video, schools, education. Notre Dame High School kicked off Inclusion Month with an assembly this morning. In March, Notre Dame highlights diversity and acceptance of all people. 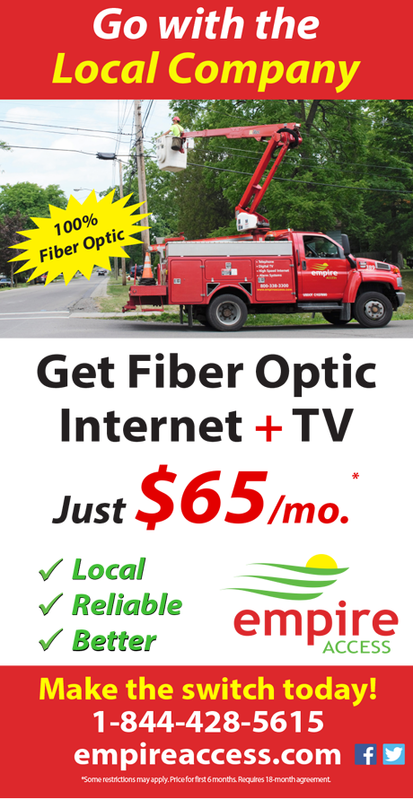 posted by Billie Owens in news, business, GCEDC, micropolitan, batavia, genesee county. 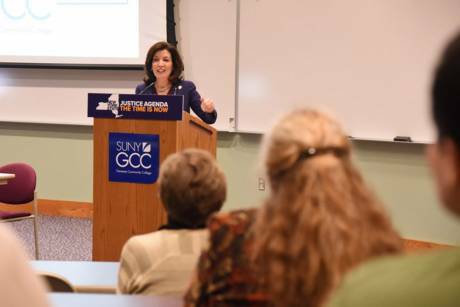 Batavia and Genesee County have continued their streak of being recognized as one of the nation’s top micropolitan regions for business growth, as the area was ranked third in Site Selection magazine’s annual rankings. The ranking of “Top Micropolitans” is based on cities of 10,000 to 50,000 people which cover at least one county. 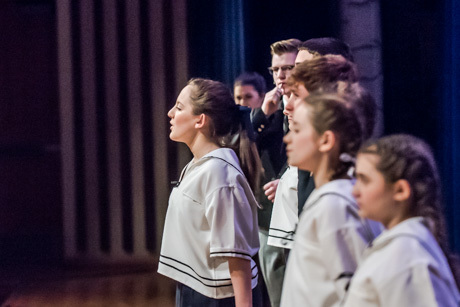 It is the 16th consecutive year Batavia and Genesee County have been recognized and the fifth consecutive year ranked in the top five. The area received its highest ranking ever in 2017 as it climbed all the way to number two among the annual survey of micropolitans across the country. “We are thrilled that the hard work that Genesee County and our partners in the public and private sector continues to be recognized as making Batavia-Genesee County the top micropolitan for business in New York,” said Steve Hyde, president and CEO of the Genesee County Economic development Center. Site Selection magazine recognized 13 of the GCEDC’s project “wins” in 2018 across several stages of project development. The GCEDC closed on 16 projects in 2018, securing $33.7 million in capital investment, 99 new jobs, and more than 189,000 square feet of new construction in Genesee County. Since 2003, the GCEDC has provided similar assistance and incentives for 465 projects which have generated $1.3 billion in capital investment and the creation and/or retention of approximately 4,627 jobs.